Some parts of the body are prone to bruising such as the shins because they have less cushion. A body lacking of vitamins, especially vitamins C and K are prone to bruising too. The color of the skin also has something to do with bruising. Those who have more transparent skin are prone to bruising because the blood underneath the surface of the skin is obvious. How does a bruise look like? 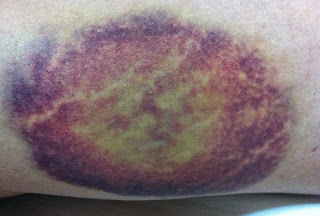 A bruise starts as a deep red-purple and over time will eventually turn into something yellow green. The color will then change into golden brown until such time that the bruise disappears. A bruise occurs if you injure yourself leading to skin inflammation and discoloration. 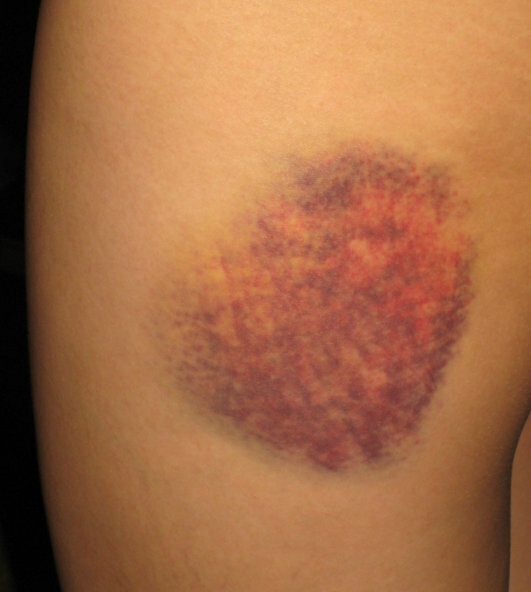 A bruise can be categorized into three: light, moderate, and basic. Light bruise is the easiest to heal. The other two types require in depth care and attention. They too can cause a few intricacies. What are the causes of bruise? Blunt trauma to the skin – This is the most common cause of bruising. Imagine falling and hitting the ground real hard. After a day, you will just notice bruising on your skin, especially on the skin that directly hits the ground. Vigorous exercise – if you are going to put your muscles under stress during exercise, a series of tiny tears will appear, which could lead to the formation of bruises. Unexplained cause - Some bruises appear for no reasons at all. It could be caused by ageing or probably a side effect of a particular medication. If you have a bleeding disorder, then you are prone to bruising and bleeding gums. Vitamin deficiency - A person with vitamin C deficiency is a high risk of having bruises. There are many different ways to get rid of bruises. Some require the use of topical cream that can be easily purchased over the counter while others can be found right in the comfort of your own home. Below are the recommended ways to remove bruises the soonest possible time. There are various brands of moisturizing bruise formula cream available in the market today. They can be purchased over the counter. You can use the cream on a day to day basis, especially if you are prone to bruising. If you are prone to bruising, you can somehow lessen the appearance of bruise by supplementing your body with vitamin C and K.
This method revolves around reducing the flow of blood to the skin, which helps reduce the bruise and pain too. Bruises tend to vanish away after a good massage using essential oil. The massaging motion separates the blood coagulation by enhancing the flow of blood. Essential oils have calming and mending properties. They help fortify the capillary dividers. Over time, it will reduce not just the bruising, but the swelling and pain too. Some essential oils great for massage include lavender, rosemary oil, and lemon grass oil. Blood flow should be permitted to promote healing, but make sure that the affected area will be kept to rest for a day or two. This is to prevent further bruising and facilitate healing. This herb is known for its ability to relieve pain and treat a variety of injuries including bruises and sprains. It has the ability to reduce inflammation. Apply arnica directly to the affected part and let its nutrients be absorbed in the skin. This plant is known for its healing and soothing properties. Hence, it is a great remedy for treating bruises and inflammation of the skin. It also helps reduce swelling and hastens the healing process. Squeeze an aloe vera to extract the juice and apply directly on the affected area of the body. Leave it there for at least 15 to 30 minutes until the gel is absorbed through the skin.